Those born with their natal Venus in the 4th House relish indulging in their home and creature comforts that provide a sanctuary away from the mental static of the world. Venus is a planet of pleasure and lust, and when found in the 4th House family album relates to a life saturated in beauty and allure, harmonious domestic circumstances, design flairs and warm relationships with family members. Venus here are hyper conscious of their security needs and become unstable, unwell, without a place of safety and tranquility. These individuals are ultra attached to their inner universe and use the 4th House waters to nourish the worlds within them. 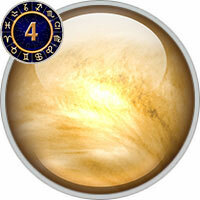 Venus in the 4th House tend to have endearing parental relationships and may receive benefits in the form of finance. These individuals have an intrinsic nurturing ability and know how to turn any house into a home; always leaving their creative personal imprint on any place of residence. The placement of Venus here indicates a genial and pleasant childhood and a creative, beguiling father; who may have been quite popular and dapper. They will tend decorate their living space with colours, collectables and family portraits and feel a strong resonance with their ancestral heritage and background. Peaceful living environments are imperative, and these individuals may go to all extremes in avoiding chaos or conflict. Most of their self identity and likes and dislikes stem will stem from their earliest conceived memories. Venus in the 4th House like creating from home and may have their own little art rooms, flower beds or imaginative home business. Venus here indicates the attachment and guidance of honourable and beautiful women who help sew together their angel wings. These individuals will seek partners that enjoy dates from home and spend romantic encounters wandering through the fairy gardens of their own backyard. Venus here are strict guardians over their hearts and save the floodgates of love for those who unlock their precious inner portals, the ones that create worlds of their own where every soul can find a place of safety. You seek balance, beauty, harmony, and peace in your home and domestic life. You might be especially attracted to luxury or quality/comfort items in the home, and you likely have an eye for interior decorating. There is a loving, personal touch to the way you decorate your home. Your love is decidedly sentimental, and you show your affection through nurturing and displays of sympathy. You don’t give your heart out easily, but when you do, you do it with great emotion. It’s very easy for you to become attached to a partner, and possibly smothering or overly dependent if you are not careful. Your parents’ marriage affects your own partnering skills and style more than most. A parent may be especially charming, beautiful, or otherwise Venusian. On the negative side, this parent may have been especially indulgent or overprotective with you.